Deputy Defense Secretary Shanahan said funding for space, cyber warfare, hypersonic weapons and other modernization efforts will be shielded from cuts, but DoD has not revealed what military programs could be targeted to pay for the administration's favored priorities. WASHINGTON — A two-year period of rising defense spending is coming to an end as the Trump administration moves to slice billions of dollars from military budgets. What this means for space-focused investments — such as missile-tracking satellites, technologies to protect U.S. satellites from adversaries and, notably, the establishment of a new military branch — is still unknown. But analysts and former government officials predict these efforts are all at risk, especially with House Democrats preparing to challenge the president on defense priorities. Deputy Defense Secretary Patrick Shanahan is expected to meet with White House officials this week to show them “what a $700 billion budget looks like” compared to a $733 billion budget. A $33 billion gap opens the door to many possible trades. Shanahan said funding for space, cyber warfare, hypersonic weapons and other modernization efforts will be shielded from cuts, but DoD has not revealed what military programs could be targeted to pay for space and other initiatives favored by the administration. Space modernization is central to the Pentagon’s strategy to stay ahead of China and Russia as these nations invest in capabilities to challenge the United States in outer space. It would be a mistake for the Pentagon to not stick with this strategy even if funding is reduced, said Jim Miller, who served as undersecretary of defense for policy during the Obama administration. 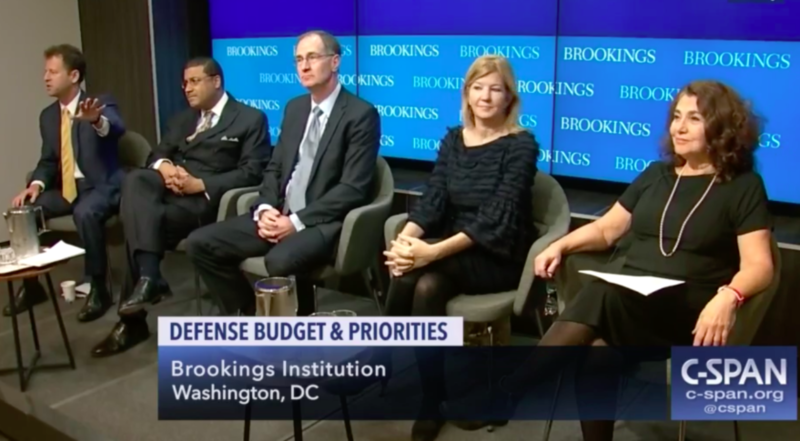 “When you have a difference between $733 billion and $700 billion, if the answer is to cut across all accounts, that’s not a strategy for great power competition,” Miller said last week during a panel discussion at the Brookings Institution. “The key question is: Will DoD put its money where the strategy is?” Miller said. The Pentagon has to protect military readiness first and foremost, but when budgets come down, the services should consider trading quantities for quality, he said. Given the challenges posed by China and Russia as strategic competitors, “my recommendation is to focus on quality, invest in research, development and innovation” even if that means sacrificing the size of the force. DoD should “invest in capacity for cyber resilience, offensive cyber and space resilience,” Miller said. Creating a Space Force as a separate military branch deserves consideration but now is not the time, he said. Elaine Kamarck, senior fellow at Brookings’ governance studies program, predicted that Democrats will not be looking for “big cuts” in defense to avoid giving Republicans an issue with which to beat them up in 2020. She said Democrats will be critical of some policies and budget allocations, but will not make any “far left broadsides” against defense. Frank Rose, former assistant secretary of state for arms control in the Obama administration, said funding for space security, missile defense sand nuclear weapons are going to be key “points of friction” because the administration the new Congress. Current plans to modernize the U.S. nuclear arsenal is estimated to cost $1.2 trillion over 30 years, according to the Congressional Budget Office. “I think there are legitimate questions over whether we can afford it.” Trump would have to give Democrats some policy concessions — such as extending the New Strategic Arms Control Treaty — to get funding support for nuclear modernization. There is bipartisan consensus for more space security, said Rose. “There is no doubt that China and Russia are developing a full range of anti satellite capabilities designed to deny the U.S. access to space derived information,” he said. “Honestly, the Space Force idea is not as crazy as it sounds. I don’t think it’s necessarily the right solution to the problem. However I think it’s a legitimate issue to discuss.” But Trump turned it into a divisive partisan issue, Rose said, and he is unlikely to get many Democrats to support it.